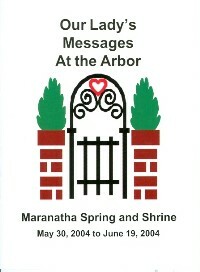 Booklet: "Our Lady's Messages at the Arbor: Maranatha Spring and Shrine". Messages from Our Lady from May 30 to June 19 in 2004. Booklet: Our Lady's Messages at the Arbor: Maranatha Spring and Shrine. 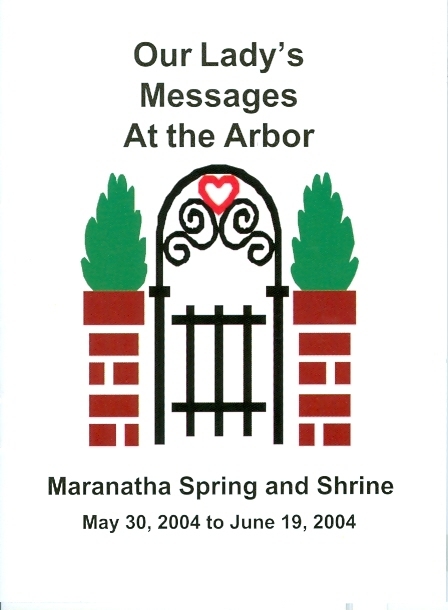 A booklet about Our Lady's special apparitions above the Arbor on the property at Maranatha Spring and Shrine from May 30, 2004 to June 19, 2004. I appear above the Arbor to bring importance to the Message of Holy and Divine Love. I desire more believe and more come here. Front cover measures 4.5 x 6 in. Softcover. 9 pages.